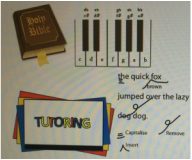 Ariel's Piano lessons and Tutoring, LLC is a Christian-based business that provides musical, educational, and proofreading and editing services. Our professionals have college backgrounds and teaching experiences are able to effectively teach children and adults how to sightread and play the piano, tutor Reading to K-12 students and Math to K-5 students, and professionally proofread and edit professional documents for businesses. and authors.